Super Steam Carpet Cleaning is a professional carpet, tile, and upholstery cleaning company. We specialize in residential and commercial accounts. 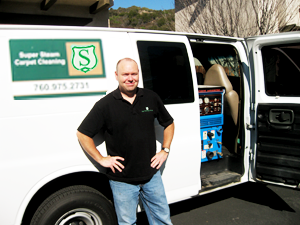 Super Steam Carpet Cleaning is local to the San Diego area and family operated. We are COMMITTED to providing high-quality service and customer satisfaction – we will do everything we can to meet your expectations. Our carpet cleaning utilizes a high powered truck mount steam cleaning extraction. We clean your carpets and furniture using the only method recommended by most carpet manufacturers – steam clean extraction. We precondition your carpet with a safe, non-toxic, environmentally friendly (no VOC) carpet pre-spray spotter. This spotter will break up the soil and loosen the dirt in preparation for deep cleaning. We then steam clean /extract the carpet with our Prochem 350 CFM truck mounted vacuum extraction steam cleaning system. This leaves your carpet instantly clean with a neutral pH. The hot steam this machine produces not only cleans, it disinfects as well. The strong vacuum we use also allows your carpet to dry within a few hours. We are licensed, insured, and our technicians are certified by the Institute of Inspection Cleaning and Restoration (IICRC). We understand that the cleanliness of your business is an important part of having a good image for your customers. We provide professional commercial carpet cleaning that will impress your customers and make your employees happy as well. 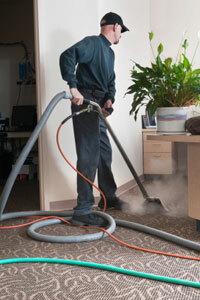 We offer affordable steam cleaning and carpet cleaning services for businesses. We understand that in these tough economic times, we all need to save where ever we can. Call Now (760) 975-2731 and take advantage of the coupon below! 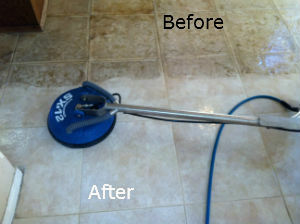 Super Steam Carpet Cleaning offers tile and grout steam cleaning services. Our professional tile and grout cleaning will get your tile up to par. You won’t believe your eyes when you see the difference in your floors! Not only will Super Steam Carpet Cleaning have your floors looking good, they will be disinfected as well. We make sure to get out the gunk that gets stuck in your grout. We will make your floors super clean and sanitized. 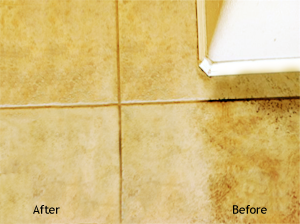 Watch our video below to witness how effective our tile cleaning services are! At Super Steam Carpet Cleaning, our IICR Certified Technicians are experts in cleaning any fabric. We provide steam cleaning services for upholstery and furniture. We use safe solutions for spot cleaning. Our non-toxic, Eco-friendly Green Seal Certified products will not harm your furniture and fabrics. We also provide leather cleaning and condition to protect your furniture from wear and tear and future stains.